Every time you take on a new home project, you are bound to make some mistakes. Every time you take on a new home project, you are bound to make some mistakes. But with some direction before you get started, you can create an easier process for yourself. Before you paint, consider these factors to create a space that is stylish and unique. When people start a room project, they often start by picking the paint color first. This will end up being a mistake because there are many other considerations you need to think about before getting to the color, including the style of the room, use of the space, furniture, and even lighting. Plan the room first and then pick a color that will complement the space. Remember that paint looks different on the walls when compared to how it looks on the swatch or in the can. Although bright colors are trendy, they can be overwhelming when they cover a wall. Instead, use the wall as your base and incorporate bright colors into other elements inside the room, including pillows, lamps, and other furnishings. If you do choose a bright color for the walls, use neutral or muted tones in your furniture to create balance. Some people forget to consider how color transitions from one room to the next. As we often leave doors open, the colors of one room can be seen from another, which affects the overall look and design of your home. It can be a tricky task but requires coordination and developing an overall color, and design story for your home. Just because your favorite color is red doesn’t mean that you should paint the walls in your bedroom a bright red. Don’t forget to consider the tone you want to set for each space. If you want to create a calming and relaxing energy for your bedroom, consider using neutral or warm tones. Remember that color isn’t just about style; it also serves a purpose. Paying attention to trends can be a good thing, especially if you plan to sell your home in the near future. 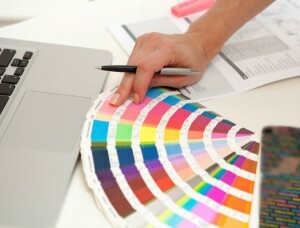 Trends are also a great place to gather inspiration, and the colors will be easy to find as they gain popularity.